Not to be confused with Glucose-6-phosphate dehydrogenase. Glucose 6-phosphatase (EC 3.1.3.9, G6Pase) is an enzyme that hydrolyzes glucose-6-phosphate, resulting in the creation of a phosphate group and free glucose. Glucose is then exported from the cell via glucose transporter membrane proteins. This catalysis completes the final step in gluconeogenesis and glycogenolysis and therefore plays a key role in the homeostatic regulation of blood glucose levels. Glucose-6-phosphatase is a complex of multiple component proteins, including transporters for G6P, glucose, and phosphate. The main phosphatase function is performed by the glucose-6-phosphatase catalytic subunit. In humans, there are three isozymes of the catalytic subunit: glucose-6-phosphatase-α, encoded by G6PC; IGRP, encoded by G6PC2; and glucose-6-phosphatase-β, encoded by G6PC3. Glucose-6-phosphatase-α and glucose-6-phosphatase-β are both functional phosphohydrolases, and have similar active site structure, topology, mechanism of action, and kinetic properties with respect to G6P hydrolysis. In contrast, IGRP has almost no hydrolase activity, and may play a different role in stimulating pancreatic insulin secretion. Although a clear consensus has not been reached, a large number of scientists adhere to a substrate-transport model to account for the catalytic properties of glucose-6-phosphatase. In this model, glucose-6-phosphatase has a low degree of selectivity. The transfer of the glucose 6-phosphate is carried out by a transporter protein (T1) and the endoplasmic reticulum (ER) contains structures allowing the exit of the phosphate group (T2) and glucose (T3). Glucose-6-phosphatase consists of 357 amino acids, and is anchored to the endoplasmic reticulum (ER) by nine transmembrane helicies. Its N-terminal and active site are found on the lumen side of the ER and its C-terminus projects into the cytoplasm. Due to its tight association to the ER, the exact structure of glucose-6-phosphatase remains unknown. However, sequence alignment has shown that glucose-6-phosphatase is structurally similar to the active site of the vanadium-containing chloroperoxidase found in Curvularia inaequalis. Based on pH kinetic studies of glucose-6-phosphatase-α catalysis, it was proposed that the hydrolysis of glucose-6-Phosphate was completed via a covalent phosphohistidine glucose-6-Phosphate intermediate. The active site of glucose-6-phosphatase-α was initially identified by the presence of a conserved phosphate signature motif usually found in lipid phosphatases, acid phosphatases, and vanadium haloperoxidases. Essential residues in the active site of vanadium haloperoxidases include: Lys353, Arg360, Arg490, His404, and His496. Corresponding residues in the active site of glucose-6-phosphatase-α include Arg170 and Arg83, which donate hydrogen ions to the phosphate, stabilizing the transition state, His119, which provides a proton to the dephosphorylated oxygen attached to glucose, and His176, which completes a nucleophilic attack on the phosphate to form a covalently bound phosphoryl enzyme intermediate. Within the Vanadium-containing chloroperoxidase, Lys353 was found to stabilize the phosphate in the transition state. However, the corresponding residue in glucose-6-phosphatase-α (Lys76) resides within the ER membrane and its function, if any, is currently undetermined. With the exception of Lys76, these residues are all located on the luminal side of the ER membrane. Glucose-6-phosphatase-β is a ubiquitously expressed, 346-amino acid membrane protein that shares 36% sequence identity with glucose-6-phosphatase-α. Within the glucose-6-phosphatase-β enzyme, sequence alignments predict that its active site contains His167, His114, and Arg79. Similar to that of the glucose-6-phosphatase-α active site, His167 is the residue that provides the nucleophilic attack, and His114, and Arg79 are the hydrogen donors. glucose-6-phosphatase-β is also localized in the ER membrane, although its orientation is unknown. The hydrolysis of glucose-6-phosphate begins with a nucleophilic attack on the sugar-bound phosphate by His176 resulting in the formation of a phosphohistidine bond and the degradation of a carbonyl. A Negatively charged oxygen then transfers its electrons reforming a carbonyl and breaking its bond with glucose. The negatively charged glucose-bound oxygen is then protonated by His119 forming a free glucose. The phospho-intermediate produced by the reaction between His176 and the phosphate group is then broken by a hydrophilic attack; after the addition of another hydroxide and the decomposition of a carbonyl, the carbonyl is reformed kicking off the electrons originally donated by the His176 residue thereby creating a free phosphate group and completing the hydrolysis. Genes coding for the enzyme are primarily expressed in the liver, in the kidney cortex and (to a lesser extent) in the β-cells of the pancreatic islets and intestinal mucosa (especially during times of starvation). According to Surholt and Newsholme, Glc 6-Pase is present in a wide variety of muscles across the animal kingdom, albeit at very low concentrations. Thus, the glycogen that muscles store is not usually available for the rest of the body's cells because glucose-6-phosphate cannot cross the sarcolemma unless it is dephosphorylated. The enzyme plays an important role during periods of fasting and when glucose levels are low. It has been shown that starvation and diabetes induces a 2-3-fold increase in glucose-6-phosphatase activity in the liver. Glc 6-Pase activity also increases dramatically at birth when an organism becomes independent of the mothers source of glucose. The human Glc 6-Pase gene contains five exons spanning approximately 125.5 kb DNA located on chromosome 17q21. 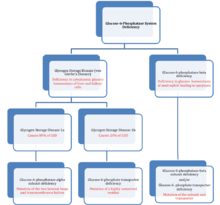 Mutations of the glucose-6-phosphatase system, to be specific the glucose-6-phosphatase-α subunit (glucose-6-phosphatase-α), glucose-6-transporter (G6PT), and glucose-6-phosphatase-β (glucose-6-phosphatase-β or G6PC3) subunits lead to deficiencies in the maintenance of interprandial glucose homeostasis and neutrophil function and homeostasis. Mutations in both glucose-6-phosphatase-α and G6PT lead to Glycogen Storage Disease Type -1 (GSD-1) called von Gierke's disease. To be specific, mutations in the glucose-6-phosphatase-α lead to Glycogen Storage Disease Type-1a, which is characterized by accumulation of glycogen and fat in the liver and kidneys, resulting in hepatomegaly and renomegaly. GSD-1a constitutes approximately 80% of GSD-1 cases that present clinically. Absence of G6PT leads to GSD-1b (GSD-1b), which is characterized by the lack of a G6PT and represents 20% of the cases that present clinically. The specific cause of the GSD-1a stems from nonsense mutations, insertions/deletions with or without a shift in the reading frame, or splice site mutations that occur at the genetic level. The missense mutations affect the two large luminal loops and transmembrane helices of glucose-6-phosphatase-α, abolishing or greatly reducing activity of the enzyme. The specific cause of GSD-1b stems from "severe" mutations such as splice site mutations, frame-shifting mutations, and substitutions of a highly conserved residue that completely destroyed G6PT activity. These mutations lead to the prevalence of GSD-1 by preventing the transport of glucose-6-phosphate (G6P) into the luminal portion of the ER and also inhibiting the conversion of G6P into glucose to be used by the cell. The third type of glucose-6-phosphatase deficiency, glucose-6-phosphatase-β deficiency, is characterized by a congenital neutropenia syndrome in which neutrophils exhibit enhanced endoplasmic reticulum (ER) stress, increased apoptosis, impaired energy homeostasis, and impaired functionality. It can also lead to cardiac and urogenital malformations. This third class of deficiency is also affected by a G6PT deficiency as glucose-6-phosphatase-β also lies within the ER lumen and thus can lead to similar symptoms of glucose-6-phosphatase-β deficiency be associated with GSD-1b. Furthermore, recent studies have elucidated this area of similarity between both deficiencies and have shown that aberrant glycosylation occurs in both deficiencies. The neutrophil glycosylation has a profound effect on neutrophil activity and thus may also be classified as a congenital glycosylation disorder as well. The major function of glucose-6-phosphatase-β has been determined to provide recycled glucose to the cytoplasm of neutrophils in order maintain normal function. Disruption of the glucose to G6P ratio due to significant decrease intracellular glucose levels cause significant disruption of glycolysis and HMS. Unless countered by uptake of extracellular glucose this deficiency leads to neutrophil dysfunction. Molecular graphics images were produced using UCSF Chimera. 1 2 3 Ghosh A, Shieh JJ, Pan CJ, Sun MS, Chou JY (Sep 2002). "The catalytic center of glucose-6-phosphatase. HIS176 is the nucleophile forming the phosphohistidine-enzyme intermediate during catalysis". The Journal of Biological Chemistry. 277 (36): 32837–42. doi:10.1074/jbc.M201853200. PMID 12093795. ↑ Nordlie R, et al. (1985). The Enzymes of biological membranes, 2nd edition. New York: Plenum Press. pp. 349–398. ISBN 0-306-41453-8. ↑ Hutton JC, O'Brien RM (Oct 2009). "glucose-6-phosphatase catalytic subunit gene family". The Journal of Biological Chemistry. 284 (43): 29241–5. doi:10.1074/jbc.R109.025544. PMID 19700406. 1 2 3 4 Ghosh A, Shieh JJ, Pan CJ, Chou JY (Mar 2004). "Histidine 167 is the phosphate acceptor in glucose-6-phosphatase-beta forming a phosphohistidine enzyme intermediate during catalysis". The Journal of Biological Chemistry. 279 (13): 12479–83. doi:10.1074/jbc.M313271200. PMID 14718531. ↑ Shieh JJ, Pan CJ, Mansfield BC, Chou JY (Sep 2005). "In islet-specific glucose-6-phosphatase-related protein, the beta cell antigenic sequence that is targeted in diabetes is not responsible for the loss of phosphohydrolase activity". Diabetologia. 48 (9): 1851–9. doi:10.1007/s00125-005-1848-6. PMID 16012821. 1 2 3 4 5 6 van Schaftingen E, Gerin I (Mar 2002). "The glucose-6-phosphatase system". The Biochemical Journal. 362 (Pt 3): 513–32. doi:10.1042/0264-6021:3620513. PMC 1222414 . PMID 11879177. ↑ Pan CJ, Lei KJ, Annabi B, Hemrika W, Chou JY (Mar 1998). "Transmembrane topology of glucose-6-phosphatase". The Journal of Biological Chemistry. 273 (11): 6144–8. doi:10.1074/jbc.273.11.6144. PMID 9497333. ↑ Surholt, B; Newsholme, EA (15 September 1981). "Maximum activities and properties of glucose 6-phosphatase in muscles from vertebrates and invertebrates.". The Biochemical Journal. 198 (3): 621–9. doi:10.1042/bj1980621. PMC 1163310 . PMID 6275855. ↑ Angaroni CJ, de Kremer RD, Argaraña CE, Paschini-Capra AE, Giner-Ayala AN, Pezza RJ, Pan CJ, Chou JY (Nov 2004). "Glycogen storage disease type Ia in Argentina: two novel glucose-6-phosphatase mutations affecting protein stability". Molecular Genetics and Metabolism. 83 (3): 276–9. doi:10.1016/j.ymgme.2004.06.010. PMID 15542400. ↑ Chou JY, Jun HS, Mansfield BC (Dec 2010). "Glycogen storage disease type I and glucose-6-phosphatase-β deficiency: etiology and therapy". Nature Reviews. Endocrinology. 6 (12): 676–88. doi:10.1038/nrendo.2010.189. PMID 20975743. 1 2 3 Jun HS, Lee YM, Cheung YY, McDermott DH, Murphy PM, De Ravin SS, Mansfield BC, Chou JY (Oct 2010). "Lack of glucose recycling between endoplasmic reticulum and cytoplasm underlies cellular dysfunction in glucose-6-phosphatase-beta-deficient neutrophils in a congenital neutropenia syndrome". Blood. 116 (15): 2783–92. doi:10.1182/blood-2009-12-258491. PMC 2974586 . PMID 20498302. ↑ Stryer, Lubert; Berg, Jeremy Mark; Tymoczko, John L. (2007). Biochemistry. San Francisco: W.H. Freeman. ISBN 0-7167-8724-5. ↑ Pagon RA, Bird TD, Dolan CR, et al. (1993). "Glycogen Storage Disease Type I". PMID 20301489. 1 2 Chou JY, Matern D, Mansfield BC, Chen YT (Mar 2002). "Type I glycogen storage diseases: disorders of the glucose-6-phosphatase complex". Current Molecular Medicine. 2 (2): 121–43. doi:10.2174/1566524024605798. PMID 11949931. 1 2 Froissart R, Piraud M, Boudjemline AM, Vianey-Saban C, Petit F, Hubert-Buron A, Eberschweiler PT, Gajdos V, Labrune P (2011). "Glucose-6-phosphatase deficiency". Orphanet Journal of Rare Diseases. 6: 27. doi:10.1186/1750-1172-6-27. PMC 3118311 . PMID 21599942. ↑ Jun HS, Lee YM, Song KD, Mansfield BC, Chou JY (Apr 2011). "G-CSF improves murine G6PC3-deficient neutrophil function by modulating apoptosis and energy homeostasis". Blood. 117 (14): 3881–92. doi:10.1182/blood-2010-08-302059. PMC 3083300 . PMID 21292774. ↑ Boztug K, Appaswamy G, Ashikov A, Schäffer AA, Salzer U, Diestelhorst J, Germeshausen M, Brandes G, Lee-Gossler J, Noyan F, Gatzke AK, Minkov M, Greil J, Kratz C, Petropoulou T, Pellier I, Bellanné-Chantelot C, Rezaei N, Mönkemöller K, Irani-Hakimeh N, Bakker H, Gerardy-Schahn R, Zeidler C, Grimbacher B, Welte K, Klein C (Jan 2009). "A syndrome with congenital neutropenia and mutations in G6PC3". The New England Journal of Medicine. 360 (1): 32–43. doi:10.1056/NEJMoa0805051. PMC 2778311 . PMID 19118303. 1 2 Hayee B, Antonopoulos A, Murphy EJ, Rahman FZ, Sewell G, Smith BN, McCartney S, Furman M, Hall G, Bloom SL, Haslam SM, Morris HR, Boztug K, Klein C, Winchester B, Pick E, Linch DC, Gale RE, Smith AM, Dell A, Segal AW (Jul 2011). "G6PC3 mutations are associated with a major defect of glycosylation: a novel mechanism for neutrophil dysfunction". Glycobiology. 21 (7): 914–24. doi:10.1093/glycob/cwr023. PMC 3110488 . PMID 21385794. ↑ "Effects of vanadyl sulfate on carbohydrate and lipid metabolism in patients with non—insulin-dependent diabetes mellitus - Metabolism - Clinical and Experimental". www.metabolismjournal.com. Retrieved 2015-06-16. ↑ Shehzad, Saima (2013-01-01). "The potential effect of vanadium compounds on glucose-6-phosphatase". Bioscience Horizons. 6: hzt002. doi:10.1093/biohorizons/hzt002. ISSN 1754-7431. ↑ Pettersen EF, Goddard TD, Huang CC, Couch GS, Greenblatt DM, Meng EC, Ferrin TE (Oct 2004). "UCSF Chimera--a visualization system for exploratory research and analysis". Journal of Computational Chemistry. 25 (13): 1605–12. doi:10.1002/jcc.20084. PMID 15264254.